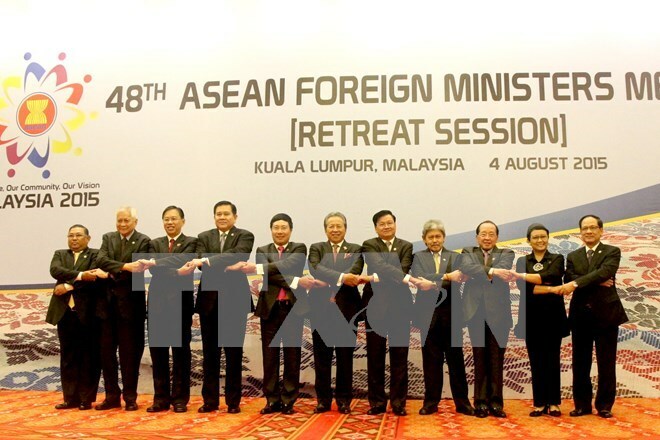 Vietnam actively participated in and contributed to the 48th ASEAN Foreign Ministers’ Meeting (AMM 48) and related meetings recently held in Kuala Lumpur, Malaysia, Deputy Prime Minister and Foreign Minister Pham Binh Minh said. During an interview granted to the Vietnam News Agency on the results of the meeting, which concluded on August 6, the Deputy PM said Vietnam affirmed its dedication to the compliance with ASEAN commitments and to the establishment of the ASEAN Community, as well as increasing ASEAN linkages and narrowing development gaps among member states. Vietnam also submitted proposals on bolstering cooperation within ASEAN and between the bloc and partner countries. The country also completed its tenure as the coordinator between ASEAN and the European Union (EU) in the 2012-2015 period, contributing to the facilitation of practical processes between the two sides. Deputy PM Minh said the ASEAN ministers expressed their determination to accelerate the implementation of member states’ commitments in an effort to establish the ASEAN Community by the end of this year. He affirmed that the AMM 48 and related meetings were not only significant in terms of linkages within ASEAN but also between the bloc and its partner countries. He briefed the journalists on the meetings’ content, including the discussion of the following priority issues: ASEAN’s post-2015 development orientation; how to increase ASEAN’s central role after becoming a community; and how to enhance relations between the group’s member states and other countries. According to the Deputy PM, the establishment of the ASEAN Community at the end of this year marks the start of a new process. ASEAN ministers deliberated visions for ASEAN’s development in the next ten years, which will hopefully be approved in the form of orientation outlines later this year. The discussed visions stressed the importance of citizens being at the centre of the community – not only benefitting from the cooperation mechanism but also actively contributing to the development of the community. Ministers also underlined the need to enhance the central role played by ASEAN, saying that it is necessary to have a common voice on all issues in order to promote unity and harmony. Minh said the different meetings between ASEAN foreign ministers and their partners, such as ASEAN Plus One with the Republic of Korea (RoK), Canada and Japan; the 16th ASEAN Plus Three with China and the RoK and Japan; the 5th East Asia Summit Foreign Ministers’ Meeting with China , the RoK, Japan, Australia, India, New Zealand, Russia and the US; and the 22nd ASEAN Regional Forum, put forth plans and visions for the intensificiation of relations between the bloc and individual countries or groups of countries. He added that the meetings also involved the discussion of peace, security and development in the region, including enhancing cooperation on terrorism and extremism prevention . The Deputy PM said the participating ministers had expressed their concern over the recent East Sea issue since it impacted on security, peace and stability in the region and beyond. They agreed that the situation in the East Sea has been complicated further in recent times, causing reasons for concern. In the AMM 48’s joint communiqué, the ministers voiced their serious concern over the recent and ongoing developments in the East Sea (also known as the South China Sea).